(Los Angeles, CA) – Today, global superstar Miley Cyrus has released her new single “Younger Now,” lyrics written by Miley Cyrus with music written & produced by Oren Yoel and Miley Cyrus. “Younger Now” is the title track off of Cyrus’ upcoming album set for release on September 29th and available for pre-order now at all digital retail providers. 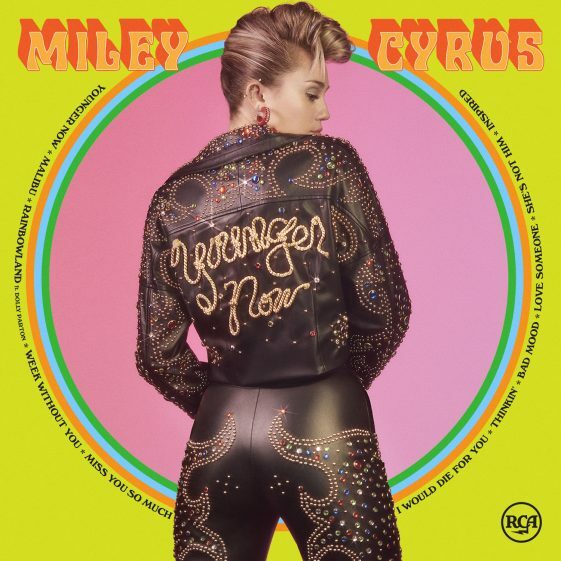 The video for “Younger Now” directed by Diane Martel and co- directed by Cyrus and choreographed by Michael Rooney, features the singer paying homage to Elvis, perfectly timed with the 40-year anniversary of his death — click here to watch. Cyrus has long professed her love and admiration for Elvis, who she considers to be one of her biggest inspirations. Cyrus is set to perform at the MTV Video Music Awards airing on August 27th where her single “Malibu” is nominated for Best Pop. This September she will return as a coach for the 13th season of NBC’s “The Voice” which premieres on September 25th. In May, Cyrus released her single “Malibu.” The music video has garnered almost 300 million views on VEVO and the song has generated 275 million streams and 4.4 million track equivalents worldwide. In celebration of Pride Month (June) Cyrus released her track “Inspired” which will also be included on Younger Now. She performed “Inspired” at the “One Love Manchester” Benefit Concert and recorded the song in her hometown of Nashville, TN. Miley made a donation to her foundation, the Happy Hippie Foundation in honor of “Inspired,” a song for #hopefulhippies everywhere, with a vision of unity that overcomes division as well as a passionate call-to-action for young people to engage in their communities and help create social change. Miley Cyrus is a singer-songwriter, actress, artist and philanthropist. With five #1 albums including her 2013 GRAMMY- nominated album Bangerz, which went Platinum in the U.S., five sold out world tours and almost 30 million tracks sold, Cyrus is one of the most influential artists in pop culture. Most recently she showcased her artistic vision on her independent album Miley Cyrus and Her Dead Petz. She is one of the most searched artists in Internet history with over 160 million digital platform subscribers and over 3 billion video views. In addition to her success in music and television, Cyrus founded the nonprofit organization The Happy Hippie Foundation to rally young people to fight injustice. Since launching, the foundation has provided direct support to thousands of homeless and LGBTQ youth across the country. In 2015, amfAR honored Cyrus’ fight against HIV/AIDS with its Award of Inspiration and the Los Angeles LGBT Center honored her work on behalf of LGBT youth with its Vanguard Award. Most recently, Cyrus has been honored with Variety’s 2016 Power of Women award for all her philanthropic efforts.